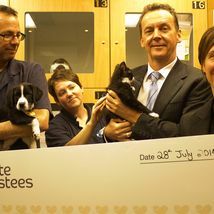 Lort Smith Adoption Centre in North Melbourne will benefit from a $4000 donation for its Sponsor a Cage initiative thanks to a State Trustees workplace giving program. Through the Wholehearted Giving Program, employees across State Trustees offices in Bendigo, Dandenong and Footscray commit to a small donation each fortnight. Employees raised $12,000 for distribution across the three sites this year. State Trustees Chief Information Officer Geoff Purcell said the giving program was incredibly well supported with around 75 per cent of employees taking part to help make a positive impact in the communities where they work. “Employees combine their donations for a bigger impact and vote from a shortlist of local initiatives to support,” Mr Purcell said. Mr Purcell said State Trustees often called on animal shelters like Lort Smith to care for and rehouse animals on behalf of people who were unable to look after them either temporarily or permanently. “State Trustees provides financial administration services for people who are no longer able to manage their own affairs including some with animals that require short term care, emergency assistance, longer term care or permanent rehousing,” Mr Purcell said. “We also see a number of people each year who leave a bequest to programs like Lort Smith’s Heart and Home to care for pets if the owner passes away. Sadly, we also see situations where provisions haven’t been made for the care of pets and, when their owners die there is no-one willing or able to take on that responsibility. Other organisations funded through Wholehearted Giving this year are The Centre for Non Violence in Bendigo and Gateway Industries in Dandenong.